Disabled holidays in Hammamet have something for everyone, from-nature lovers to foodies. Its laid-back vibe is influenced by its history as a small fishing town on Tunisia’s northern coast. A Hammamet holiday will give you a rainbow of colours to enjoy, with soft, white sands, sparkling blue seas and fragrant orange and lemon trees dotted around the resort. 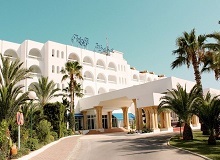 Set in a whitewashed structure with an arched facade, this polished, adults-only, all-inclusive hotel on a Gulf of Hammamet beach lies just 45 km from Enfidha-Hammamet International Airport.